Despite a joint agreement and lofty words, the first-ever summit between the US and North Korea appears to have made little progress in achieving the much-anticipated goal of denuclearizing North Korea, analysts said. But the agreement is a repeat of North Korea’s previous, illusive promises on denuclearization, Seoul-based analysts said, as it lacks specific measures to ensure Kim surrender his ultimate guarantor of security in a complete, verifiable and irreversible manner. “It is another diplomatic triumph for North Korea. I don’t understand why Trump signed such an agreement,” said Park Won-gon, a security expert and a political science professor at Handong Global University. “It looks like the Panmunjeom agreement between the two Koreas -- or even the Rodong Shinmun,” said Park, referring to the joint agreement adopted after the inter-Korean summit in April and the reclusive regime’s state newspaper. The first meeting between Kim and South Korea’s President Moon Jae-in was criticized for lacking specific measures for denuclearization. Faced with controversy, Moon said the details of denuclearization should be addressed during the Trump-Kim summit. In its front page article published Monday, Rodong Shinmun reported that North Korea was seeking to establish a new relations with the US, build a permanent peace regime on the Korean Peninsula, and achieve the goal of complete denuclearization on the peninsula. Even compared to the previous “failed” nuclear negotiations – whether they were bilateral or multilateral ones – the Trump-Kim agreement has left so many “parentheses” to be filled out during what would be an arduous process, the experts added. “Now I understand why Trump described his meeting with Kim as a ‘get-to-know meeting.’ If that was the agreement Trump was looking for, he should have left the meeting after just taking pictures with Kim,” said Park. One of the biggest holes in the agreement is a thorough verification of North Korea’s nuclear materials and production facilities, experts noted. North Korea has reportedly concealed nuclear facilities in a hidden location across the mountainous area. Inspecting those sites is viewed by nuclear experts as the most extensive process in the history of nuclear armament. A renowned nuclear scientist Siegfried S. Hecker told New York Times that it would take up to 15 years to denuclearize North Korea. “Despite its historic significance. It’s such a shame that we can’t see the word ‘verifiable’ when they agreed on complete denuclearization,” said Yun Duk-min, former chancellor of the Korea National Diplomatic Academy. When asked by the reporters whether the agreement lacked a thorough inspection, Trump said the nucelar facilities would be verified without providing further details. He said he had learned a lot about the complicated process involved, and was convinced that while it would take “a long time” to complete, North Korea would effectively lose its nuclear weapons capability at an early stage in the process. “There will be a point at which when you are 20 percent through, when you can’t go back.” Trump said, specifically disputing the argument by prominent nuclear scientists that it would take up to 15 years for North Korea to denuclearize. While the Trump-Kim summit falls short of fulfilling its initial expectation of producing tangible measures on denuclearization, it might have been an “intentional decision” made by the two leaders for their own political gains, a North Korea expert said. Both Trump and Kim appeared to stake their political careers on the summit. Besieged by political scandals at home, Trump has also drawn criticism for his decision to withdraw from the joint communique at the G-7 summit. Kim, for his part, is appears to be more eager than ever to get economic sanctions lifted -- a key component to fulfilling his dream of transforming his nuclear-armed impoverished country into an prosperous one. “Neither leader can afford to make the summit a failure as there are so many things at stake. 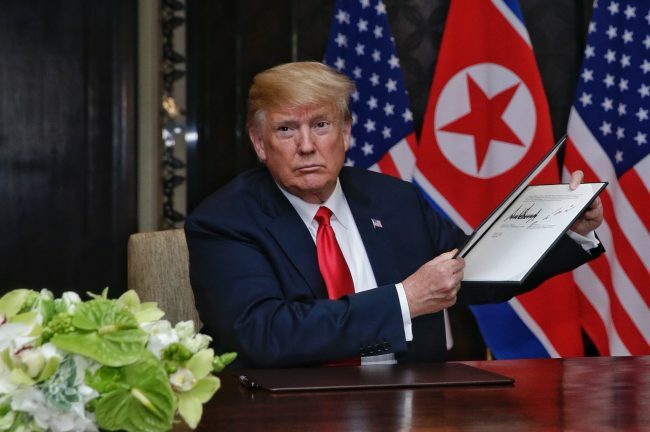 … They have no choice but leave the parentheses in the agreement,” said Hong Min, director of the North Korean studies division at the Korea Institute for National Unification. The remaining issues would be addressed through working-level talks and further summits between the US and North Korea, Hong added. Trump hinted there would be additional summits with Kim, possibly in Pyongyang or Washington. Further negotiations are expected to follow as early as next month over thorny issues -- such as detailed terms and a timeline of North Korea’s denuclearization process, which would involve the complicated process of verification and inspection. “I think there was difference of opinions over the denuclearization process during the working-level talks. 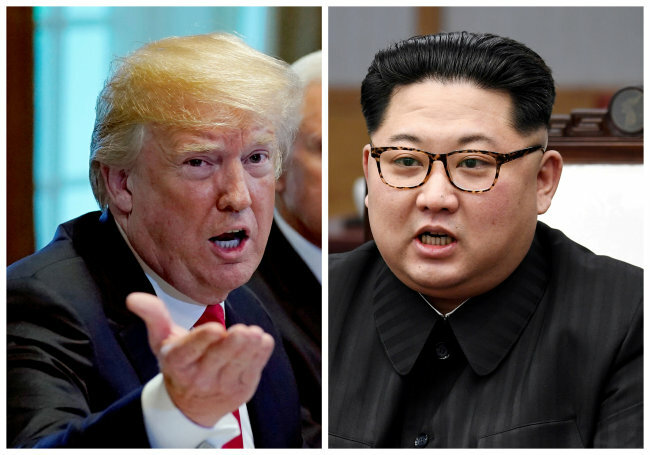 Unlike other summits, Trump-Kim meeting proceeded in a top-down manner and the officials would not have had enough time to prepare it,” Hong said.